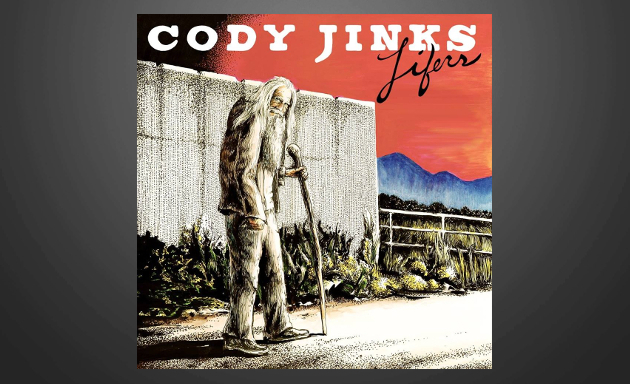 Cody Jinks will be releasing his latest, highly-anticipated record Lifers on July 27th through Rounder Records who just signed a deal with the Ft. Worth-based songwriter, and Jinks will be releasing a new single “Must Be The Whiskey” on June 15th. Now we have a track list for Lifers, which gives us a little more insight on what to expect from the 11-song record. One song many Cody Jinks fans are happy to see make the cut is a tune called “Colorado” that Cody wrote with good friend and long-time touring partner Ward Davis. Ward has been playing the song now for a year or so, and often Cody would come out and join him on the track. Another song Cody Jinks fans have been hearing in concert recently is “Can’t Quit Enough,” which was debuted in New Orleans at The Joy Theater in January. Jinks also played the song at Mile 0 Fest in Key West, FL a week or so later, and has featured it occasionally live since then. The song starts off, “I’ve played every honky tonk and roadside bar and juke joint between here and Minneapolis, you know I’ve lived these miles…” and is a honky tonk scorcher. The first single from the album “Must Be The Whiskey” is an unreleased song written by underground country songwriter and performer Josh Morningstar from Hagerstown, Maryland. Morningstar has been recording and releasing albums for many years out of the purview of most, including 2017’s Whole Lotta Crazy. Getting the first single from a Cody Jinks album will certainly be a step up in name recognition for Morningstar. Josh Morningstar has toured with artists such as Billy Don Burns, Colter Wall, and Shooter Jennings recently, and along with Ward Davis, will be performing at the Tumbleweed Festival in mid June. Fans are being told to text JINKS to 31996 for updates on pre-order information, and other news pertaining to Lifers. While he might be completely on the level – and I hope he is – I would very much check how much texting that number costs before sending anything to it. Yeah, I don’;t think Cody Jinks is going to start peddling you a timeshare, though I understand your trepidation. With Facebook making its algorithm to where your favorite artist can’t reach you anymore, I suspect we see much more of this by artists who want to stay in touch with their core fans, and don’t want to rely on a 3rd party to do so. If it’s in a Colorado I might be interested. He can even be there during my vaca… I would tolerate that. At 2 songs less than his last and 1 less than Adobe, I hope this fits on one disc. Might sound silly to some but I think some vinyl lovers might agree. I will buy it anyway, of course. If this is worth anything, I’ve been signed up for like 10 days and haven’t been scammed. Yay for Cody Jinks, and yay for information thwt doesn’t come through Facebook. I ditched fb 3 years ago and the thing i miss most is the touring schedules, i keep telling bands to put it on their website or email it or anything but fb. I’m excited for a new Jinks album. I’ve been down and not listening to any music (not even the new American Aquarium) because when I went to see Tyler Childers in Morgantown and I got into it with another concert goer and left before the end of the show. It was after Childers played Silverstein’s “I Got Stoned and I Missed It.” Some guy asked me to stop raising my hand. That’s my thing… I raise my hand and yell when I’m into the show. Well, I couldn’t let it go (especially since everyone else was raising their hands) and we eventually had to leave before it got physical. I don’t get it. I stay away from seated venues for this exact reason. I should have just punched him in the mouth. Hopefully a new Jinks record will cheer me up. That is standard crap, man. Don’t take it to heart, and forget about it! If I dwelled on all all the d-bags I’ve gotten into it with over the years, I would never leave the house!!!! As CountryRoads said, don’t dwell, it’s the other guy’s problem. Music needs people like you, get out there and shake your thang! Also looking forward to the new Jinks. There’s a Whitey Morgan collaboration on it as well. Funny thing is when we saw Jinks last year, I thought for sure there would be a fight…. nicest crowd and everyone had a great time. I think the thing with the Childers’ crowd is he’s had a devoted following who isn’t very happy with us newcomers. It seems his early shows we chill, acoustic events… now we show up yelling, dancing and raising our arms. You might have been directly behind me at 123. There were 2 guys that were getting a little heated during Tyler’s set. You wouldn’t happen to be the one I had the conversation with about Hellbound Glory? Yes! That was me! And I was throwing my fist in the air as much as you guys were (I thought). The guy who took issue with my fist raising was a portly fellow and it was 110 degrees in that room so he had to be miserable, but just move if my arm is obstructing your view. I’m been so depressed since that night. I was looking forward to the concert and that was not how I thought it would go down. Damn, it’s a small world. I could tell from your comments on SCM we ended up at a lot of the same shows. Don’t let that guy bother you. he’s probably the type that goes out looking for a fight and you just happened to be the unlucky one that ended up in front of him. If he didn’t like people putting their fists in the air he was at the wrong place! Glad to see Colorado make the album. Cody should release it to country radio, it’s a good song and I’ve always felt it might work well for a mainstream audience. Is Holy Water a Big and Rich cover? No disrespect to that Big & Rich song (its one of their stronger efforts), but Cody Jinks doesn’t seem the type who looks to cover Big & Rich songs. Haha good point. Although Holy Water is an amazing song so I wouldn’t complain. He doesn’t seem like the type to cover Pink Floyd either on second thought! I don’t know, he used to front a metal band so I could see Pink Floyd being a big influence. I agree that the Pink Floyd cover kind of came out of nowhere, but he nailed it. Too bad the YouTube acoustic covers he did after Chris Cornell’s death probably won’t be officially recorded and released. He killed it with “I Am The Highway”. Regarding Big & Rich, they have actually somewhat grown on me as a mainstream band. I though “Save A Horse” was terrible, and they have definitely had some clunkers in their discography, but as a whole they have largely put out solid, if unremarkable songs. “8th of November” remains probably their strongest effort in my mind.